My grandaughter's American Girl doll is wearing her latest creation. 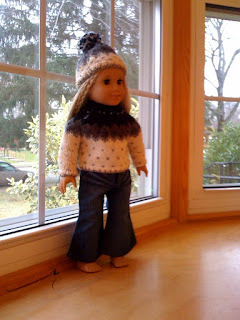 I blogged about this project previously, but just got the first picture of the doll wearing it! It fit so well that I'm amazed. a set for my granddaughter but I'm having trouble with the skirt. It's rolling up. I've thought about pressing it before the waistband is knit and the pleats formed. Or,maybe trying to block it once it's finished. How did you handle this? You skirts lie marvelously flat! !I'm a bit of a novice and would really appreciate any suggestions. So sorry, but I didn't actually make the skirt. The doll is wearing pants. However, if you are using wool, then blocking will help. Some stitch patterns curl naturally like stockinette stitch and there isn't a whole lot you can do.